The Toyota 2AZ-FE is a 2.4L 4-cylinder engine that was available in both Toyota and Scion vehicles. Due to it’s small size, the engine was a perfect fit for sedans and crossover SUVs like the Toyota RAV4. You can find this engine in vehicles from 2000 to 2012. Over the twelve year period of production the engine only received slight modifications by Toyota. Unfortunately, this engine is known to burn oil after reaching 45k miles and is a problem that must be watched carefully. The AZ series engine was a replacement for the Toyota S series engine that was produced from 1980 until 2007. Eventually the AZ engine was replaced by the larger AR version in 2008. For the North American markets, the 2AZ-FE engine was built at the Toyota Motor Manufacturing Kentucky, Inc. plant. This engine found a home in the Toyota Camry, RAV4 and Highlander beginning in 2002. This engine was a popular choice for Toyota because it was a powerful, yet fuel efficient engine. It featured Toyota’s VVT-i technology. VVT-i is a continuously variable intake valve timing system designed to improve gas mileage and efficiency. The 2AZ-FE engine was a small yet powerful engine. It produced 160 hp (120 kW) at 5600 rpm and 162 lb·ft (220 N·m) of torque at 4000 rpm. Designed as a straight 4-cylinder engine, it had a displacement of 2.4L or 2362 cc. The bore was 3.5 in (88.5 mm) and stroke was 3.8 in (96.0 mm). It featured a compression ratio of 9.6:1. Over the years the engine was only slightly modified. Some versions of the engine had an increased compression ratio of 9.8:1 and a more aggressive cam profile. These modifications increased the performance rating to 161 horsepower in the Scion tC and 177 horsepower in the RAV4. In addition to VVT-i technology, the 2AZ engine used a direct ignition system and an electronic throttle control system (ETCS-i). The Scion tC was available with an optional TRD supercharger. The engine had a inline 4-cylinder configuration. The block was constructed out of aluminum with cast iron cylinder liners. The 2AZ-FE was also equipped with aluminum cylinder heads. As I mentioned earlier, the engine featured Toyota’s VVT-i technology with dual overhead cams and 4 valves per cylinder. The crankshaft was built from forged steel giving the engine a solid backbone designed to last over 200,000 miles. 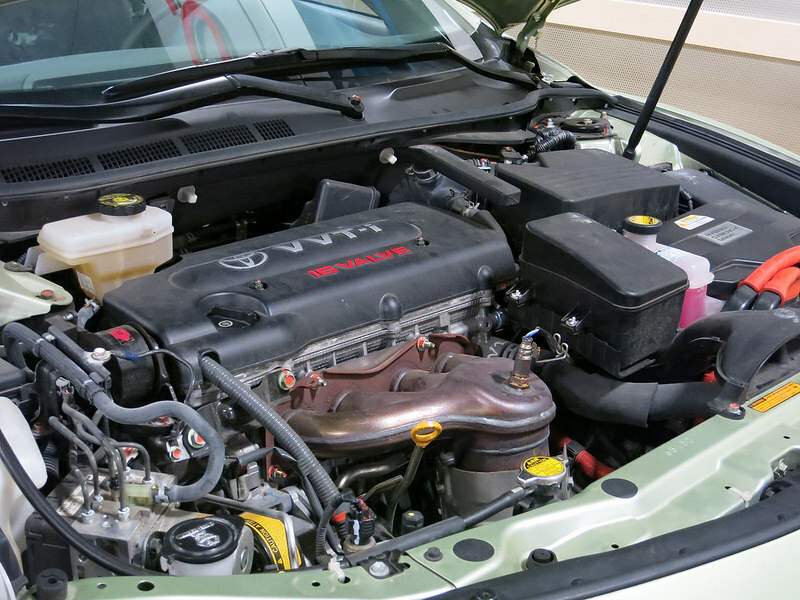 Toyota produced over 3.5 million Camry cars from 2002-2009 with this 2.4L engine. It would not be over exaggerating to estimate that there are still millions of Toyota 2AZ-FE engines on the road today. Overall, the engine offered plenty of horsepower while still being fuel efficient. That being said, the engine has had problems with significant oil consumption – using up to 1 quart of oil every 1,200 miles! Toyota issued a Technical Service Bulletin to address the issue and offered an extended warranty. Due to this issue it is recommended that you check the oil frequently and add oil as needed.